The main benefit of making your own smoothies from scratch is that you can choose exactly what goes into them. Store bought smoothies may taste great but they are often full of processed sugars and preservatives, making them much less healthy. Using fresh ingredients is a better option. Very nutritious - smoothies make use of ingredients such as spinach, strawberries, chia seeds and almond milk. All of these are excellent sources of vitamins and minerals including iron, magnesium and vitamin C. Your body needs these nutrients to stay strong and healthy and smoothies provide a convenient way of replenishing their stores. Easy to consume - smoothies are both fast to make and consume, compared to many other foods. Eating a salad is going to take a fair amount of time, especially with all the chewing involved! But with a smoothie, all you have to do is pack the ingredients into a blender, pour the processed liquid into a glass and gulp it down. Rich in fiber - when you juice fruits and vegetables, you get rid of most of the fiber. This is not the same with smoothies; many of them are loaded with fiber! Dietary fiber helps your gut function optimally which means you don't struggle when you visit the bathroom. Delicious - smoothies are extremely appealing to the palate which is why people love them. Also, they are very versatile in terms of the ingredients you can use to make them; this means that you can swap ingredients that you don't like the taste of, for ones that you do. Kids love them - children enjoy drinking smoothies, especially those that resemble milkshakes. This is great news for parents because they are very healthy and filling, making them an ideal after school snack. Get your 5 a day - it is recommended that you eat at least 5 portions of fruits and vegetables per day; adding smoothies to your diet makes this much easier. And since they are already in liquid form, your body has to do less work to digest them. Hydrating - many people mistake thirst for hunger and so either end up overeating, or snacking on junk foods. Dehydration also causes tiredness, irritability and dull looking skin. If you are not a fan of drinking plain water all the time, add a green smoothie to your diet; the water content from the liquid base, fruits and vegetables will keep you hydrated. Great post workout - after you hit the gym hard for 45 minutes, your body needs a good dose of protein to help repair and grow those ruptured muscles. Drinking a smoothie containing whey protein powder, nuts and seeds will do just that. Adding some coconut water and green vegetables will also help replenish electrolytes that you have lost through sweat. Filling - smoothies are very filling and depending on the ingredients you use can be consumed in place of a meal. For example, due to their convenience, many people opt to have a calorie dense, protein and carbohydrate rich smoothie for breakfast rather than eating solid food. Ideal for weight loss - smoothies that contain lots of vegetables are great for people who are trying to lose weight because they are low in calories and at the same time keep you feeling full due to their high fiber and water content. This in turn means you are less likely to binge on unhealthy snacks. Cheap - homemade smoothies are cheap to make. Most fruits and vegetables do not cost much and they keep well for at least a week, in the fridge. The prices of smoothie makers / blenders vary largely but many high quality and affordable ones are available online. Sorry, no smoothies matched your filter criteria. You might think that green smoothies taste horrible but that is simply not the case. Green smoothies are just smoothies that are, you guessed it, green in colour, because of a certain ingredient used in the smoothie that is abundant in that colour. 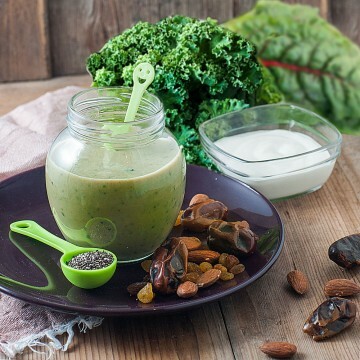 For example, our "Creamy Concoction" is a green smoothie due to the kale and spinach used to make it. However, it tastes nothing like spinach or kale; the blueberries, mango and pineapple provide a sweet flavour and the Greek yogurt and avocado provide a creamy consistency. The pigment that gives many plants their green colour is the same pigment that gives these smoothies their deep hue: chlorophyll. Chlorophyll helps plants turn sunlight into energy, through the process of photosynthesis. Chlorophyll also brings a lot of health benefits to the human body. For example, it behaves as an antioxidant and helps protect you from damage caused by free radicals. Free radicals are responsible for causing all kinds of health issues such as cancer and dementia. Green leafy vegetables such as kale, spinach and Swiss chard are excellent sources of vitamins and minerals such as iron and magnesium. I am sure you have heard that breakfast is the most important meal of the day. You have just spent the last 8 or so hours without any food - your body is hungry! Skipping breakfast has been scientifically linked to higher rates of obesity, an increased risk of developing type 2 diabetes and suffering from coronary heart disease. On the flip side, having a good breakfast helps with weight loss efforts, weight management, improves your concentration & memory and generally makes you feel more energetic throughout the day. What you eat for breakfast also matters. Sure, you can gobble down 2 chocolate doughnuts, but that's not going to do your body any good; they are packed with sugar and trans fats and will leave you crashing by 11 am! Instead, you want to eat (or drink) something filling, that is rich in protein and also has a good amount of healthy carbohydrates and fats. Our breakfast smoothie recipes do just that, providing you with a healthy dose of each of these key macro nutrients. To help mix things up, also try out our other healthy breakfast ideas. All of our smoothies are bursting with essential vitamins and minerals that your body needs, in order for it to remain strong and healthy. For example, carrots are rich in vitamin A, guavas in vitamin C, chia seeds in calcium and pumpkin seeds in zinc. Mixing and matching these ingredients means that you get a heavy dose of all these wonderful nutrients - much like taking a multivitamin, only natural. However we thought we would also create smoothies that were overloaded in certain nutrients. For example, our "Sweet Beta Carotene" is an excellent source of vitamin A, mainly due to the key ingredients it contains: fresh carrot juice, sweet potato, kale and spinach. Similarly, we have created recipes for vitamin C, E & K, calcium, potassium, iron, magnesium and zinc. You've just finished an epic workout in the gym and now your body is craving a good dose of protein. Not only does protein promote muscle growth, it also helps you maintain a healthy weight and keeps you filling fuller for longer. There are two main types of proteins, complete and incomplete proteins. Complete proteins contain all of the 9 essential amino acids that your body requires, which it cannot produce itself. Meat and eggs are complete protein sources as they provide all of these essential amino acids. But who in their right mind would want to make a smoothie that contains either of these 2 ingredients? Plant protein sources on the other hand are considered to be incomplete. But not to worry, they still can contain a large amount of certain amino acids that are essential for the body. And by adding whey protein powder, milk or Greek yogurt to a smoothie, you ensure that you are consuming a complete protein. Smoothie bowls are great, especially if you prefer to eat your smoothie instead of drinking it down. All that a smoothie bowl is, is a regular old smoothie put into a bowl (or any other container that you can eat from, for that matter) and covered with various toppings. The smoothie part tends to contain less liquid, thereby giving it a thicker consistency. This makes it easier to eat with a spoon. A great trick to help make smoothies thicker is to use frozen fruits such as bananas and mangoes. Smoothie bowls work well for breakfast, as eating them is similar to eating a regular bowl of cereal. However they tend to contain much less sugar, and little to no preservatives or artificial flavourings. In order to lose weight successfully, you need to consume fewer calories than what your body is using up. Doing this means that you end up using your body's fat stores as a source of energy. At the same time, you want to make sure that most of the calories you are consuming are from healthy food sources that contain good proteins, carbohydrates and fats. Smoothies are great for people who are trying to lose weight as they are rich in nutrient dense foods, low in unhealthy fats and also contain high levels of protein and / or fiber, which keep you feeling fuller for longer. You should try to replace any unhealthy snacks such as cakes, ice cream or potato crisps with a smoothie containing vegetables and fruits instead. That being said, smoothies are not a weight loss miracle; you still need to monitor your total calorie consumption in order to lose weight effectively. But by making smoothies a part of a healthy diet and combining this with regular exercise, you will start to see those layers of fat disappear. Getting children to eat vegetables, especially green ones, can sometimes be a difficult task. I know from personal experience that I disliked eating a lot vegetables in my younger days. Unfortunately, I hadn't been introduced to smoothies in the early 90's. 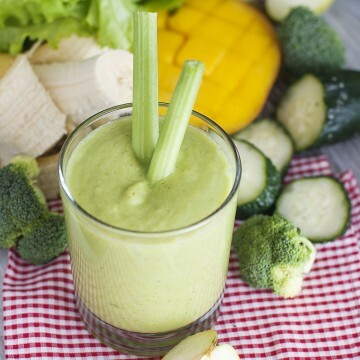 The trick to making vegetable smoothies healthy, but palatable at the same time is to add fruits and ingredients like honey to them, which makes them much sweeter. Fruits such as grapes, mangoes, pineapples, bananas and blueberries contain good amounts of naturally occurring sugars. Dried fruits such as raisins and dates contain even more. Another helpful pointer is to try make your children's smoothies thick and colourful - this makes them resemble ice cream and milkshakes which we know all kids love!